We transform businesses and the lives they touch. To us it's personal. 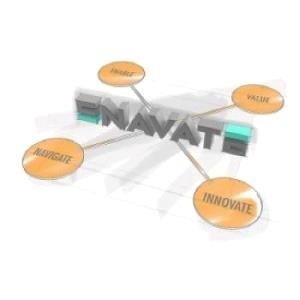 Why the name ENAVATE? We chose a compound version of the many words that describe the 'how' and 'why' of our business. When working with ideas such as Enable Success, Navigate, Innovate, Create Value, Enterprise, and Ignite Innovation = Make the Future Work. Now - well, ENAVATE simply seemed like the obvious construction. Team – We take care of our own. Innovation – We explore, evolve, and seek excellence on every level. Results – We are achievers who set high goals and reach them. Integrity – We are trustworthy. Our word is our bond. Great outcomes begin with a clear vision of what is possible and a driving passion to get there. At ENAVATE, we have looked into the future and outlined what we want our character, composition and culture to be three years down the road. Our Vision 2020 document is a compilation of our aspirations, and is the driving force behind everything we do for our clients, partners and employees.